Fire-weary Oregonians are like soldiers lately returned from the battlefield who duck at the sound of a car backfiring – a glimpse of smoke in the distance raises anxiety. But fall is when the counterpoint to wildfire emerges on the landscape: prescribed forest burning. 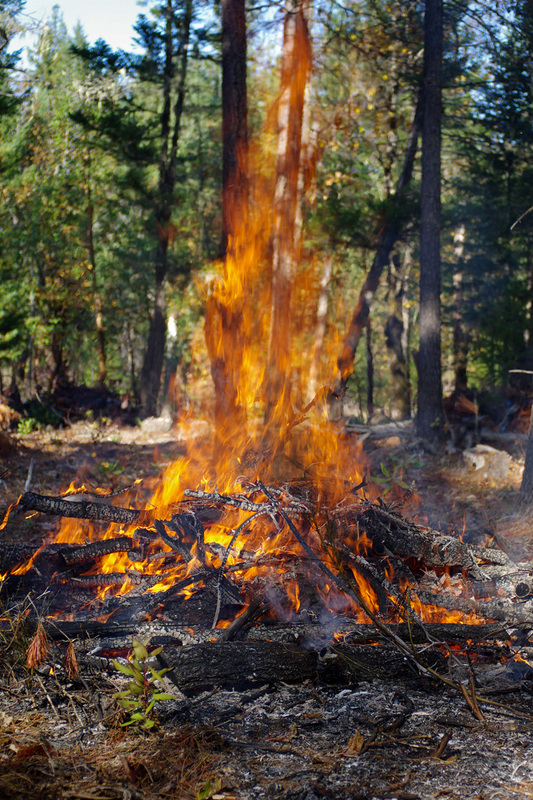 Unlike wildfires, which occur under the worst of conditions, prescribed burns are conducted only when weather and wind patterns are optimal to carry smoke up and away from communities and popular recreation sites. And forest operators and wildland fire agencies staff the sites with fire engines and personnel to prevent the burns from spreading outside of designated burn units. The Oregon Department of Forestry’s (ODF) meteorologists nail the forecast much of the time. But wind shifts occasionally push some smoke from prescribed burns into populated areas. However, most agree the tradeoff is well worth it. Some 200,000 acres of forestland undergo prescribed burn treatments annually in the state, and the resulting clean-up of logging debris and excess vegetation greatly reduces the risk of damaging wildfires on those lands during the summer. 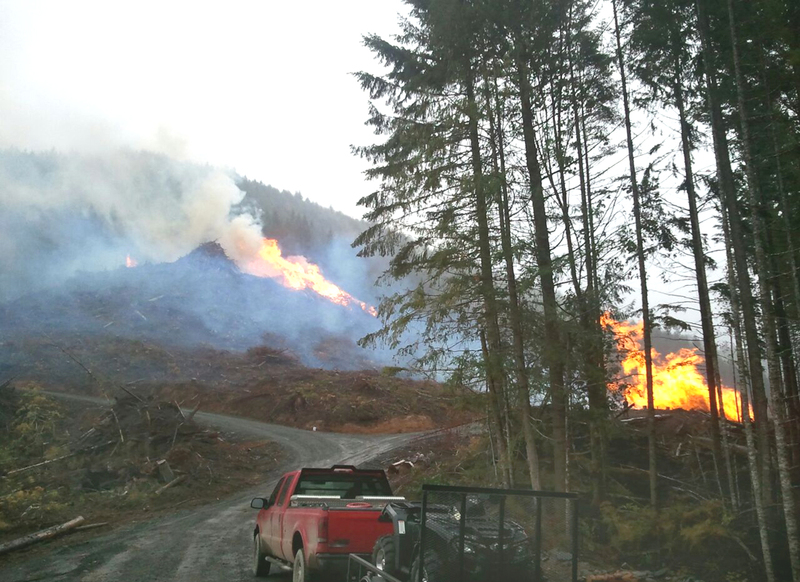 The man who heads up ODF’s firefighting program believes that significantly expanding Oregon’s prescribed burning program would improve the wildfire situation. “I’d like to see the 200,000 acres of annual prescribed burning double,” said Doug Grafe, chief of ODF’s Forest Protection Division. Three severe wildfire seasons in a row, 2013-15, have reinforced his fervor for forest fuel treatments via prescribed fire. When a wildfire moves into a tree stand that has been previously thinned and excess shrubs and grasses removed, he said, the flames tend to stay on the forest floor. Wildland firefighters are able to attack a ground fire directly. But when a wildfire ignites in a stand where the trees are close together and brush is thick, it will likely move into the crowns and race through the stand. Direct attack is dangerous in this scenario, so fire managers must resort to air tankers and helicopters – effective, but costly tools. The high intensity of a wildfire burning in a fuel-rich forest often does long-term damage, wiping out entire tree stands and in some instances sterilizing the soil. In contrast, a wildfire in a fire-treated forest typically leaves many of the trees alive. 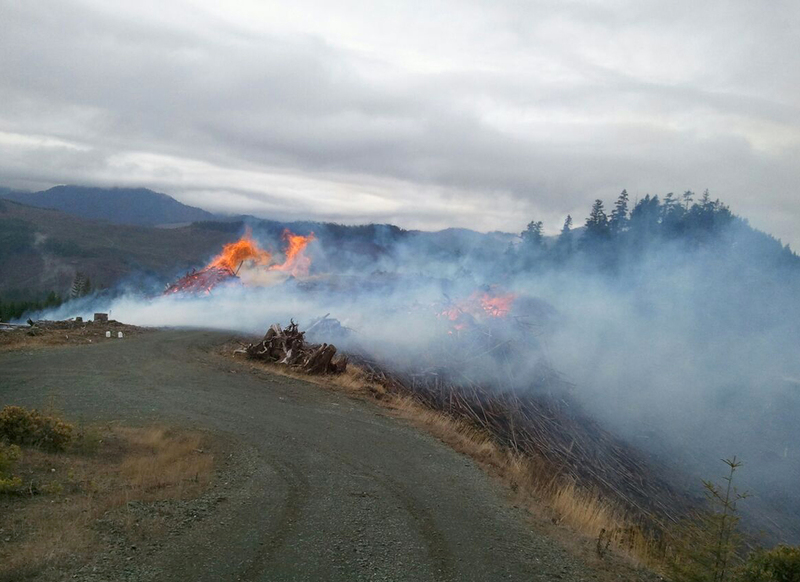 Prescribed burning is already underway in some parts of Oregon, where the fall weather pattern of cooler temperatures and higher humidity has lowered the risk of a burn escaping control. 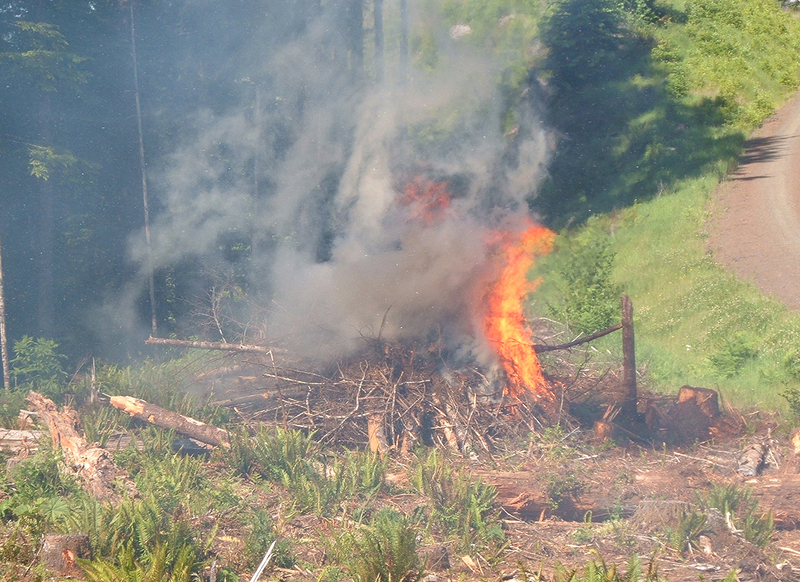 But in many areas, ODF is holding off on issuing burning permits till the seasonal rains set in. 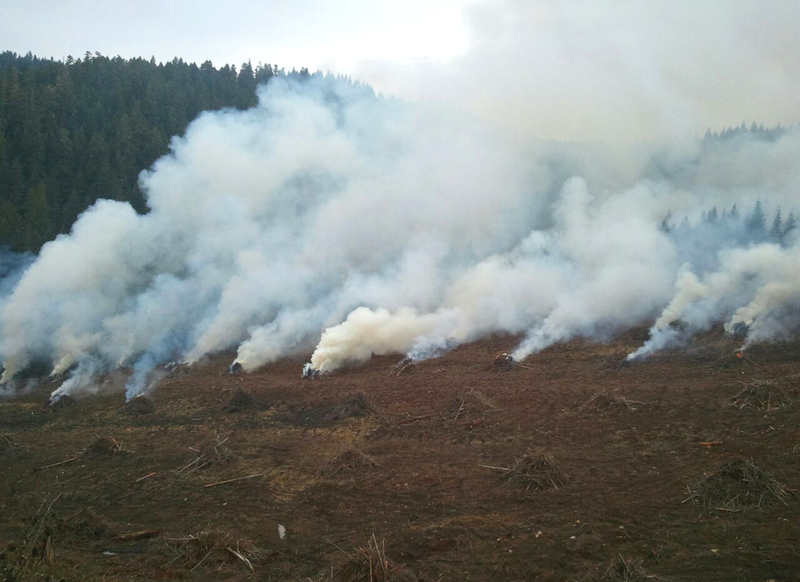 For example, forest landowners in ODF’s Northeast Oregon District have some 10,000 acres of burn piles ready to light whenever they get the go-ahead from the department, likely in early November. 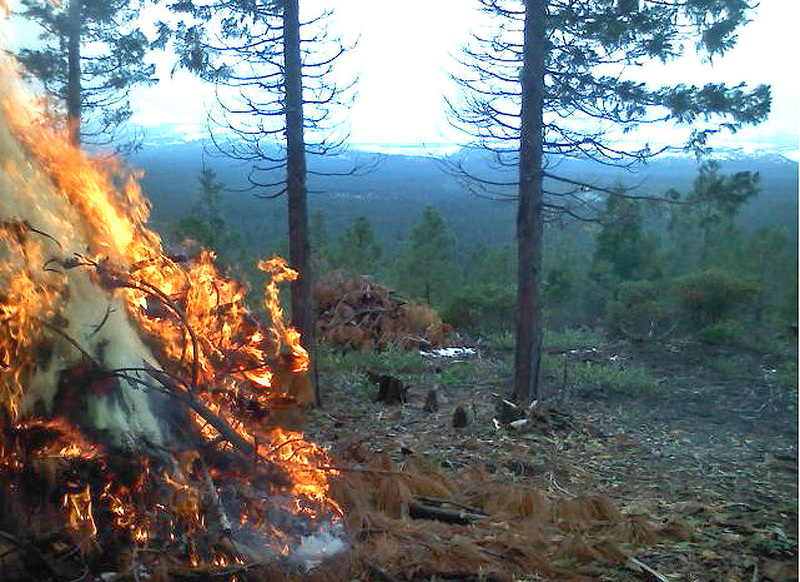 The Klamath-Lake District says it will also wait till then before issuing burn permits.